Today is Palm Sunday, and I'm preaching on palms. 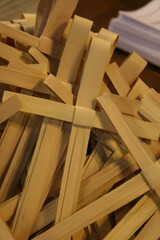 It's the beginning of Holy Week---sometimes called the "Week of Weeks" in the Christian tradition. It's the week that we celebrate what defines us as Christ-followers: The Resurrection. Christians are called to live into the hope that identifies us as Resurrection People: the hope of resurrection and restoration for all of Creation. The Church is called to embody what it looks like when the Shalom or Peace of God in Christ rests over all things. Unfortunately, we have lost the plot. That's why I wanted to preach on palms today. In the story of Jesus' triumphal entry into Jerusalem that you can read HERE we are invited to locate ourselves within the narrative. As Jesus entered Jerusalem for the Passover, he did so in a dramatic way: riding on a donkey with people waving palm fronds and throwing down their cloaks in the road. It was a demonstration that was reserved for royalty or conquering heroes. This is a scene that resonates with our culture. We like this Jesus because we like winners. The great coach of the Green Bay Packers, Vince Lombardi, famously said, "Winning isn't everything, it's the ONLY thing." No one remembers who came in second. Champions get the t-shirts and hats in our culture just like they got palm fronds and ivy wreaths in the ancient world. To quote that great contemporary theologian Ricky Bobby, "If you ain't first, you're last." There. I threw down a Talladega Nights reference. How many times have you met someone and they began to relate to you all of the ways that they have screwed their life up? Or all the ways that they have failed, or fallen short? Not too many times, I bet. Most of us don't unload our failures to people we barely know. We want everyone to assume that we're winners, that we matter. That's the story of our culture. Ironically, if you Google the word "winning" right now, the first thing that pops up is "Charlie Sheen"
Here's the thing: A life worth living isn't based on winning. That's the lesson the palms teach us. Palms were a symbol of Jewish nationalism and victory. In 2 Maccabees 10:7 we find an account of how Judas Maccabeus liberated Jerusalem from a tyrannical Syrian king--a king who desecrated the Temple and terrorized the Hebrew people. He was greeted with wreaths of ivy, palm fronds and a whole lot of celebrating. Too bad things didn't stay that way. The Romans came along and basically did the same thing. The ancient Jewish people wanted a Messiah who was going to set things right. They wanted a win. Maybe you want a win right about now. Maybe you're tired of losing. You're thinking to yourself, "If I could just win the lottery ONCE, that would solve a lot of problems." Personally I think the Lottery is a tax on people who can't do math, but you can dream, right? The problem is that these people missed the point with Jesus. They had all of the notes and none of the music. They had the rules without the relationship. They didn't realize that knowing the truth and doing the truth are two different things. I read that a professor asked his students, "Is it possible to make an A+ in the course of ethics and still flunk out in life?" Is it possible to get all of the Christian "stuff" down pat, and still miss the point about how life isn't all about "winning?" You bet. After the Resurrection, the symbol of the palms changed for the early Christians. They used it to signify victory over the enemies of the soul. Martyrs were pictured as holding palm fronds because it demonstrated how Christ had defeated sin and death, and they had nothing to fear. So which palm are you waving as Jesus enters our lives during this Week of Weeks? Does your palm symbolize how you would really like Jesus to make your life better... to "fix" the things that are wrong? To give you a "win?" Or are you waving the palm that symbolizes how nothing---not sin, not death, not anything--can really defeat you because Jesus is risen... that true victory isn't about "winning?" Where are you in the story? Are you celebrating Jesus today and ready to crucify him on Friday because he doesn't meet your expectations? Are you throwing your cloak down in the road in front of him now, but all too ready to deny you even know him later? A life worth living isn't based on winning.